Another lost post – although my original draft has completely disappeared this time so I clearly messed up big time! PH0004983/171 Variation Accepted: Operating between PENZANCE, Bus Station/ FALMOUTH, Moor and HELSTON, Tesco given service number 2/2A effective from 08-Aug-2012. To amend Route and Timetable. PH0004983/172 Variation Accepted: Operating between PENZANCE Bus Station and GWAVAS/MOUSEHOLE given service number 5/5A/6/6A effective from 02-Sep-2012. To amend Timetable. PH0004983/186 Variation Accepted: Operating between PLYMOUTH Bretonside Bus Station and LAUNCESTON Westgate Street given service number 76 effective from 02-Sep-2012. To amend Timetable. PH0004983/187 Variation Accepted: Operating between FALMOUTH Moor and TRURO Treliske Hospital/NEWQUAY Bus Station given service number 68/68A/88/88B/89/90/988/989 effective from 02-Sep-2012. To amend Route and Timetable. PH0004983/373 Variation Accepted: Operating between Camborne Bus Station and Helston Tesco given service number 39 effective from 08-Aug-2012. To amend Route and Timetable. PH0004983/376 Variation Accepted: Operating between Helston and Redruth given service number 34 effective from 08-Aug-2012. To amend Route and Timetable. 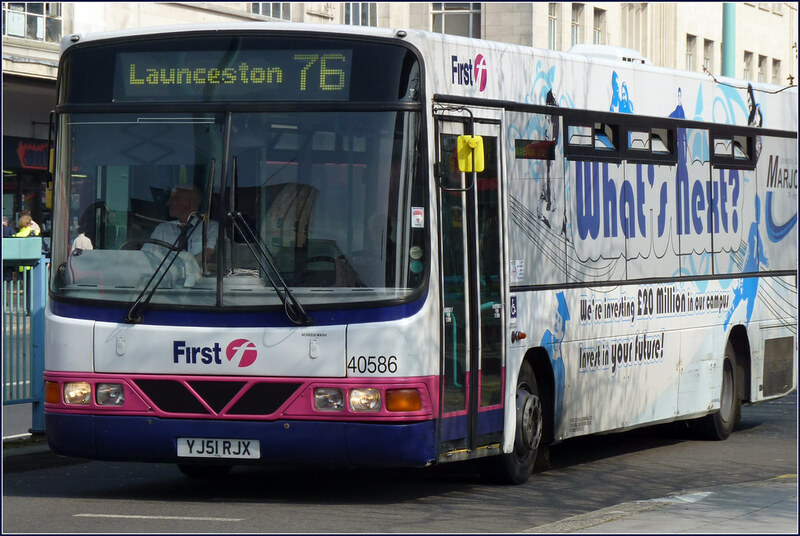 PH0004983/439 Variation Accepted: Operating between Launceston and Bude given service number 76 effective from 02-Sep-2012. To amend Timetable. PH0004983/440 Variation Accepted: Operating between Helston and Falmouth given service number 35 effective from 08-Aug-2012. To amend Route and Timetable. PH0004983/441 Variation Accepted: Operating between Helston and Coverack given service number 36 effective from 08-Aug-2012. To amend Route and Timetable. PH0004983/446 Variation Accepted: Operating between Camborne and Helston given service number 45 effective from 08-Aug-2012. To amend Route and Timetable. PH0004983/171 Variation Accepted by SN: Operating between PENZANCE, Bus Station/ FALMOUTH, Moor and HELSTON, Tesco given service number 2/2A effective from 08-Aug-2012. To amend Route and Timetable. PH0004983/373 Variation Accepted by SN: Operating between Camborne Bus Station and Helston Tesco given service number 39 effective from 08-Aug-2012. To amend Route and Timetable. PH0004983/374 Variation Accepted by SN: Operating between Helston and Helston given service number 38 effective from 08-Aug-2012. To amend Route and Timetable. PH0004983/376 Variation Accepted by SN: Operating between Helston and Redruth given service number 34 effective from 08-Aug-2012. To amend Route and Timetable. PH0004983/440 Variation Accepted by SN: Operating between Helston and Falmouth given service number 35 effective from 08-Aug-2012. To amend Route and Timetable. PH0004983/441 Variation Accepted by SN: Operating between Helston and Coverack given service number 36 effective from 08-Aug-2012. To amend Route and Timetable. PH0004983/446 Variation Accepted by SN: Operating between Camborne and Helston given service number 45 effective from 08-Aug-2012. To amend Route and Timetable. PH0004983/447 Variation Accepted by SN: Operating between Helston and The Lizard given service number 37/937 effective from 08-Aug-2012. To amend Route and Timetable. PH1081198/12 Cancellation Accepted by SN: Operating between Kingsbridge Area and Kingsbridge Area given service number The Coleridge Bus 2 effective from 14-Jul-2012. PH1081198/13 Cancellation Accepted by SN: Operating between Kingsbridge Area and Kingsbridge Area given service number The Coleridge Bus 1 effective from 14-Jul-2012. PH1081198/14 Cancellation Accepted by SN: Operating between Kingsbridge Area and Kingsbridge Area given service number The Coleridge Bus 3 effective from 14-Jul-2012. PH1081198/15 Cancellation Accepted by SN: Operating between Kingsbridge Area and Kingsbridge Area given service number The Coleridge Bus 4 effective from 14-Jul-2012. I assume that these services are now operated by someone else? Sadly these buses seem to be the norm on the 76 although 40586 is usually on Plymouth routes. A trip from Derriford to the City Centre is more than long enough on this bus so dont think I fance a long trip to Launceston on it! It appears that the Cornwall alterations to the 2/2A, 34 - 39 and 45 are of a temporary nature due to the street markets in Helston on Wednesdays in August.